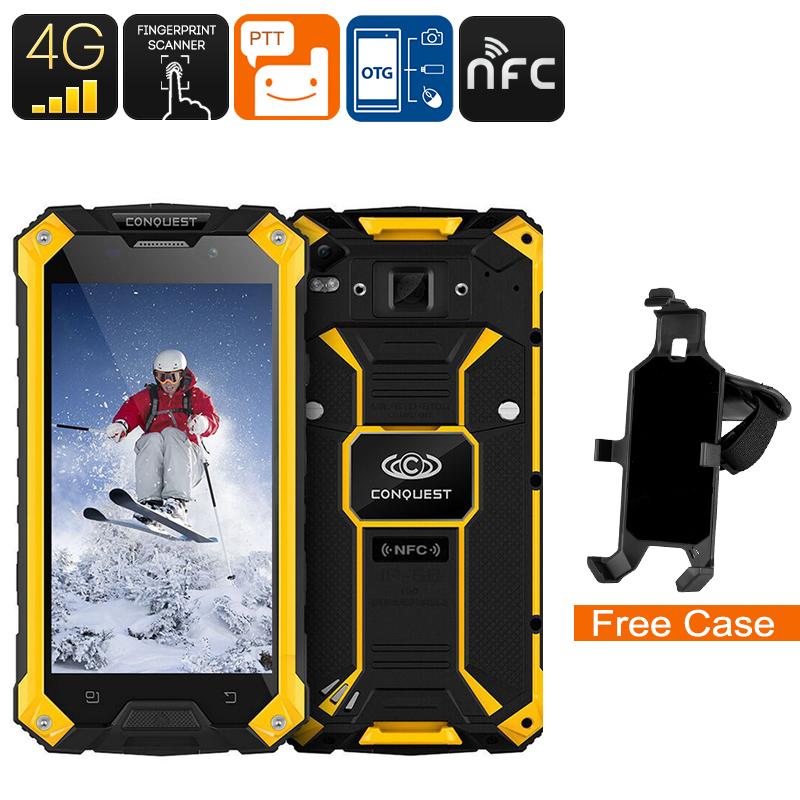 Successfully Added Conquest S6 Rugged Phone - Android 6.0, IP68, 5 Inch HD Display, Dual-Band WiFi, 4G, Octa-Core CPU, Fingerprint, NFC (Yellow) to your Shopping Cart. The Conquest S6 is an extremely durable rugged phone. It comes with a waterproof IP68 design. This means that your cell phone is fully protected against water, drops, and dust. This Android smartphone is great for people that are working in tough environments. With its Android 6.0 OS, it brings along all the latest software features. You will be able to enjoy a smooth yet powerful user experience no matter what you do. This rugged phone lets you play games, watch movies, browse the web, and more. There is nothing you can’t do with this rugged smartphone at your side. With 4G connectivity, this rugged phone takes your connectivity to the next level. You will always be able to browse the web. Additionally, it supports Dual-Band WiFi. Thanks to this, you’ll be able to enjoy the fastest network speeds while at home or in the office. The Conquest S6 furthermore packs a powerful 6000mAh battery. With this, your rugged phone packs enough juice to get you through multiple days. For those of you that enjoy games and media, the Android phone holds 32GB internal storage. Additional memory can be added through its 32GB SD card slot. Inside this rugged phone, you’ll find the MediaTek 6735 processor. This Octa-Core CPU has been clocked at 1.3GHz. If you are looking for a powerful performance, this Android phone is perfect for you. It additionally comes with 3GB RAM to further increase its capabilities. Other features such as NFC and OTG will heighten your user experience even more. For the outdoor enthusiasts among us, this rugged smartphone even comes with an SOS feature. This makes the Conquest S6 the perfect outdoor companion. On its 5-Inch HD display, you’ll be able to enjoy crisp 720p images. No matter where you are, from now on you’ll always be able to enjoy a game or movie. The phone also comes with a fingerprint scanner. This little feature brings along high security and great efficiency. In the rear, your Android phone holds a stunning 13MP camera. With this snapper, you’ll be able to capture breathtaking photographs and FHD video at any time of the day.